World of Warcraft: Battle for Azeroth gives the MMO a darker tone and a refresh, but can it topple Legion? World of Warcraft: Legion was the culmination of a years-long crescendo of rising stakes and comic-book theatrics, ending with the apparent defeat of the biggest-bad in all of Warcraft. Perhaps wisely, Blizzard chose not to try and top that with the latest expansion. What results instead is something that feels fresh, a little darker, and with more immediate stakes. Battle for Azeroth, the game’s seventh and latest release, is opening fire in less than a month. I’ve spent the last few months diving into alpha and beta phases of this year’s new content, and have the rundown of what to expect this August 14. Once I’d perfected the fine art of creating the ideal Gnome, it was time to dive into new lands. 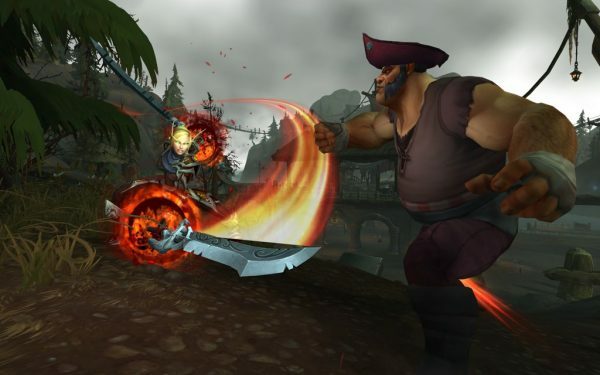 The World of Warcraft universe has grown massively with each expansion, and the artists at Blizzard have managed to exceed themselves each time. Battle for Azeroth is no exception, with some of the most well-crafted environments to date. Of course, there is some alpha jank – in fact, an entire mansion was missing geometry and textures, sitting as an ominous grey cube at the edge of a cliff – but even at such an early stage, Kul Tiras and Zandalar are impressively well made. We’ve come a long way from the smoothed out mountain bulges of 2004. Now, I admittedly spent most of my time on the Alliance side of things – after the beta reset progress, I could only find the time for one deep dive. Sorry, reds. First stop, Drustvar, a grim forested mountain region in Kul Tiras. If anything stands as an example of just how sharply Battle for Azeroth shifts in tone from Legion, it’s Drustvar’s witchy woods. Uncovering hidden cults and fending off ancient spirits makes for a spooky start to my expansion adventures. The more low-key intrigue and darker fantasy gives Drustvar – and Kul Tiras at large – a distinct Fable vibe. That’s the first one, not later titles where Lionhead’s franchise went all Oliver Twist, although Tiragarde Sound does see you rescuing kiddies from an exploitative factory. The feeling is only compounded by the locals – burly lads and lasses with accents you could consider somewhat English. The magic in the land is dark and raw, with the region feeling more low-fantasy than the Warcraft norm. In sharp contrast to Drustvar, the Horde begins in the cursed swamplands of Nazmir. Oozing with an atmosphere of dread, overflowing with derelict temples, burial grounds, and a necropolis dominated by what can only be described as The Hell Sun. 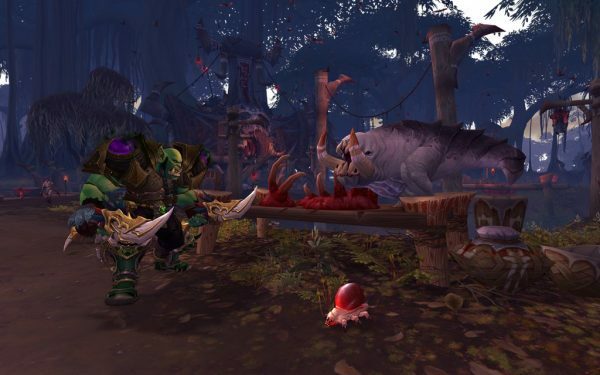 Horde players attempt to make deals with the various Troll gods, in an attempt to rid the land of the cannibalistic blood trolls. Having an entire continent dedicated to one of Blizzard’s more troubling racial stereotypes leaves a bit of a sour taste at times, mind. Trolls have always felt particularly iffy, as the Carribean-coded voodoo cannibals, and that slams hard against Blizzard’s 2018 image as the “progressive” triple-A publisher. While the stories Battle for Azeroth tells are full of intrigue and action, actual questing feels like a step backwards from Legion. I couldn’t tell if there are objectively more straight-up kill and collect quests, but it certainly felt like I was being offered more busywork. The vistas and storylines presented are fantastic, but they’re hard to experience while trying to yank the teeth out of sick dinosaurs. It wouldn’t be Battle for Azeroth if there wasn’t any battling going on, right? The title itself suggests that we’re gonna spend a lot of time punching Orcs and knocking out Night Elves. While there’s a neat new battleground and some significant changes to world-PvP, Blizzard is taking some interesting steps towards emulating the player-versus-player experience without actually having to engage other players. The first of these to open up is Island Expeditions – two teams of three fight over a small island, racing to gather resources. The pacing of this mode feels great, with matches escalating to include full-on boss fights and incidental skirmishes against faction foes. 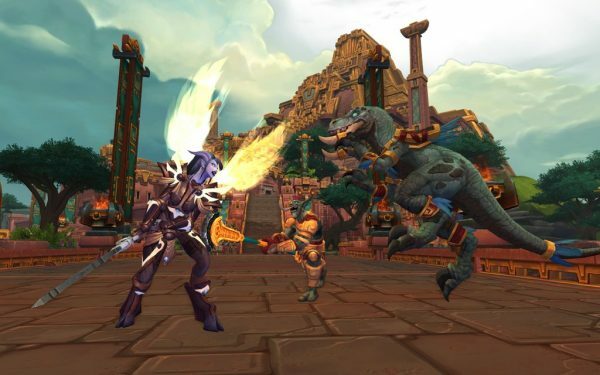 This mode is available against other players, but Blizzard has also began giving player-like AI to NPCs that provide a fair enough challenge on their own. While I missed testing periods, Warfronts take this a step further – taking the faction war fantasy to eleven while removing PvP from the experience entirely. Though factions are largely separated on their own islands in the open world, there are quest chains that’ll take you to each other’s continents should you wish to get some open-world skirmishes going. Finally, there’s a raft-load of gameplay and quality-of-life changes coming to BFA that are too numerous to list here. A host of new features have already hit the live game, like voice chat channels and a complete UI overhaul. Artifacts are gone, and that’s for the best. Acquiring those legendary tools of war was novel, but the process of upgrading them was long and, frankly, tedious. It felt like a reintroduction of Warcraft’s original talent system, rewarding hours grinding Artifact Power with a 1.5% increase in eyebrow-plucking. In their place is the Heart of Azeroth – a necklace that upgrades through artifact power, but implemented in a unique way. Levelling up the Heart opens up customisation options in special pieces of gear – defined ability customisation choices, that also serve to make these pieces of armour feel like a real treat to pick up. In lieu of defining classes by a special weapon, Battle for Azeroth is attempting to roll back some of the class homogenisation that began happening in recent expansions. Some artifact skills have rolled back into talent trees, long-ignored abilities like Hunter’s Mark have returned, and active buffs are back, baby. If you’re playing on the live servers right now, you’ll have noticed your hard-fought raid gear isn’t scraping level 1000 anymore. Blizzard’s gone and done another number-squish – and whille realistically, this is a quality-of-life change, it adds into Battle for Azeroth’s tonal shift. No longer are we throwing billion-damage hits at gods in the void between worlds. Battle of Azeroth is a near-total refresh for the ageing MMO, but expectations are high after Legion’s outstandingly high-quality. The last expansion arguably saved the game from the abysmal Warlords of Draenor, and Blizzard needs to show it can keep the good times rolling. It’s in the long game where Battle for Azeroth, like all expansions, will be tested. Legion kept new raids, new story, and new worlds dropping throughout its two-year lifespan – naturally, stuff that can’t be experienced in a pre-launch beta. For now, things are looking cautiously optimistic. From a huge emphasis on launch-day scenarios, to two new continents and a swathe of pseudo-PvP side-modes, it’s looking like there’ll be plenty to keep players occupied for those valuable opening months.